Last night, we had, for the first time in 14 months, a game where second place had exactly half of the leader’s score. This is the first time that this has happened since tie games were abolished in November 2014. Last night, Amelia Hershberger elected not to bet the extra $1, risking a tiebreaker with Ben Almoite. On The Final Wager last night, Keith said that while he would bet the extra $1, that he wasn’t sure what Amelia’s preference would be. I disagree with having or condoning any preference to bet $0 here, and would always suggest “bet for the win”. Here’s why. What Has To Happen For Me To Lose? One thing I ask myself a lot, especially near an endgame when playing competitive Scrabble, is “What has to happen in order for me to lose this game?” I find that helpful, as knowing what not to do helps me avoid mistakes that will cost me games. This thought process can be helpful here as well. 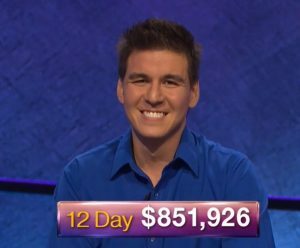 1) Bet $1, Ben bets everything, Ben gets Final Jeopardy! correct, and Amelia misses Final Jeopardy. 2) Bet $0, Ben bets everything, Ben gets Final Jeopardy! correct, and then wins the tiebreaker question. (Obviously, there are other ways to lose this game, but they would be massive strategic blunders). What are the chances of each happening? Thankfully, the numbers are readily available to us. If you go to J! 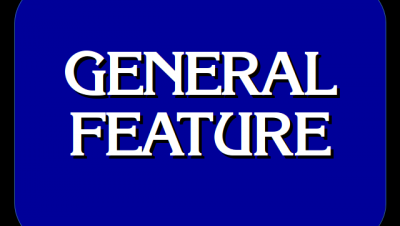 Archive, you can find, at the bottom of each season’s listings of games, links to various Daily Double, Final Jeopardy, and miscellaneous statistics. So, what are the chances of Situation 1 above happening? In that situation, the only way to lose is if Ben gets Final Jeopardy and Amelia misses it. As you can see, on average, the situation in which Amelia loses takes place only 18.46% of the time. Here, Amelia loses if Ben gets Final Jeopardy! correct, then wins the tiebreaker. This is a little bit more difficult to calculate. Anyone who watched Ben’s early buzzer dominance, especially in MOVIE CATCHPHRASES, would venture that in the case of last night, Amelia was likely not a 58% favorite on any sort of tiebreaker. Is this sort of thing calculable, though, in a general sense? It does stand to reason that someone leading going into Final Jeopardy usually has shown an advantage in both knowledge and buzzer timing throughout the game. This is, to a degree, generally expressed in the J! Archive stat “batting average”. Thus, 44.60% * 42.19% = 18.81%. Thus, in the average case, the two numbers do turn out reasonably close equal (18.46% vs 18.81%). However, there is one major caveat to looking at the averages: While I do not have the individual game data to plot this out, my gut feeling is that one major things skew the averages: Superchampions who have dominated (Arthur Chu, Julia Collins, Alex Jacob, and Matt Jackson come to mind.) Thus, I would say that instead of the batting averages being normally distributed, the median would be a little bit less than the mean, with the data having a long tail to the right. 2) If you are a superchamp, then you’ve likely demonstrated that you have a superior knowledge base than most opposition. The chances of Situation 1 happening: Still less than you think they are. In both cases, it means to me that the percentage play is now to bet the $1 and go for the win then and there, and not risk the tiebreaker.